This food isn’t readily availble in the shops, but I was excited to find it at My Pet Warehouse and Pet Circle. It’s one of the better brands available in the US, so it’s nice to see it can be bought in Australia too. 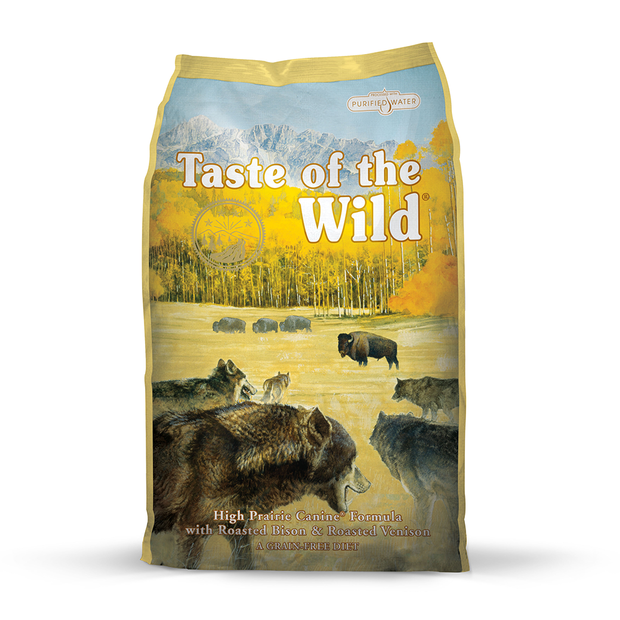 Taste of the Wild aim to cater for a dog’s natural diet, and they do a good job. 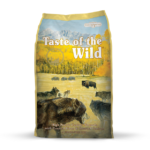 It’s a grain free food which is always a very good start as dogs don’t need grains, they need meat, and in this food we find plenty of it – bison, venison, lamb meal, chicken meal. This is absolutely fantastic and a rare find, making this food a solid 5 stars even before discussing the other ingredients. As well as further quality meat ingredients we also find a whole range of fruits, veggies, vitamins and minerals. The ingredients list looks like a shopping list for the organic food store. I find this food very hard to fault. It’s very well balanced, high in meat proteins, low in carbs, and packed with great ingredients. Bison, venison, lamb meal, chicken meal, egg product, sweet potatoes, peas, potatoes, canola oil, roasted bison, roasted venison, natural flavor, tomato pomace, ocean fish meal, choline chloride, dried chicory root, tomatoes, blueberries, raspberries, yucca schidigera extract, Enterococcus faecium, Lactobacillus casei, Lactobacillus acidophilus, Saccharomyces cerevesiae fermentation solubles, dried Aspergillus oryzae fermentation extract, vitamin E supplement, iron proteinate, zinc proteinate, copper proteinate, ferrous sulfate, zinc sulfate, copper sulfate, potassium iodide, thiamine mononitrate (vitamin B1), manganese proteinate, manganous oxide, ascorbic acid, vitamin A supplement, biotin, calcium pantothenate, manganese sulfate, sodium selenite, pyridoxine hydrochloride (vitamin B6), vitamin B12 supplement, riboflavin (vitamin B2), vitamin D supplement, folic acid.